Louise Caseley is the Good Pitch Strategic Advisor, Impact and Outreach. Louise is passionate about innovative approaches to tackling societies most pressing issues. 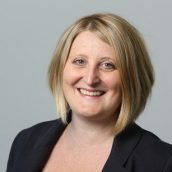 She brings over 12 years of experience in overseeing and enabling major collaborative solutions, working in partnership with government, companies, philanthropy and the not-for-profit sector. Before joining Good Pitch Australia Louise was a Director at Social Ventures Australia, where she was responsible for a number of major programs including developing innovative cross sector approaches to improving school to work transitions, and tackling long-term unemployment across Australia. Prior to this, as Fundraising Manager at National Society for the Prevention of Cruelty to Children (NSPCC), she worked with the organisations most significant funders to fund existing and develop new programs.